Kytai Nguyen, a nationally recognized professor of bioengineering at The University of Texas at Arlington, endured many challenges as a young girl in Vietnam and, later, as a woman struggling to graduate from college and begin her career in academia in the United States. Her perseverance molded her into the person she is today, and her story earned her the inaugural Embracing Challenge Award from Materials Today magazine and the Elsevier Materials Science Council. The award was created to recognize researchers in the field of materials science and engineering who have overcome difficult circumstances to pursue their research career and who are contributing to new knowledge in the field. Nguyen will be honored at the Materials Research Society conference Nov. 29 in Boston, Mass. Elsevier is a world-leading provider of information solutions and publisher of more than 2,500 journals and 35,000 book titles. "It is an honor to receive the first Embracing Challenge Award," Nguyen said. "I have faced many challenges in my life, and I know I am a survivor because of those hardships, which helped me become who I am." 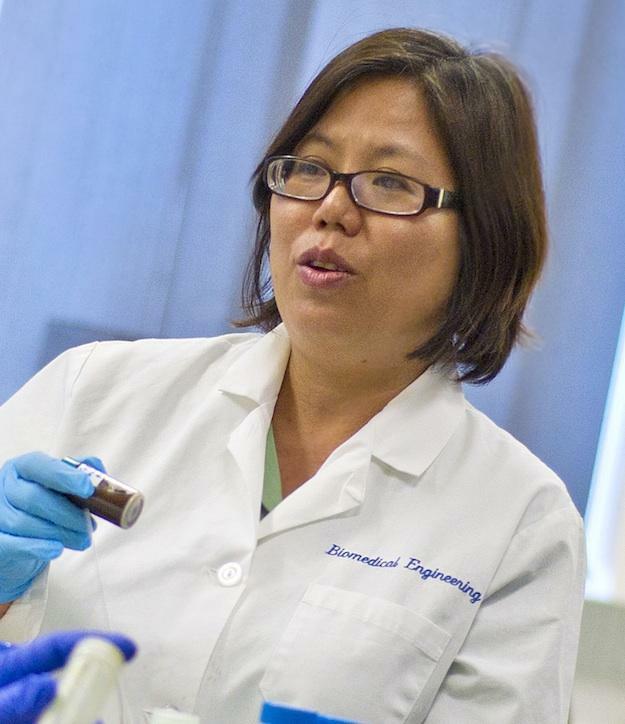 Although she works in bioengineering, Nguyen's research in nanomaterials – specifically nanocomposites and nanoparticles for targeted drug delivery, hydrogels and scaffolds for tissue engineering – relates directly to materials science and engineering. Khosrow Behbehani, former dean of UTA's College of Engineering and the man who hired Nguyen as chair of the Bioengineering Department, lauded the accomplishment. "Dr. Nguyen is very deserving of the Embracing Challenge Award. To endure the hardships that she has faced, then to become a top researcher in her field shows the fortitude of her spirit, and UTA is indeed fortunate to have her on the faculty," he said. The Materials Science Council, chaired by Professor Subra Suresh, former director of the National Science Foundation and current president of Carnegie Mellon University, selected the winner based on her achievements and the challenges she overcame in realizing these achievements. The prize includes a $5,000 prize and all-expenses-paid attendance at the award reception. The council was impressed with the way Professor Nguyen overcame several challenges during her formative years and the challenges she faced here, too. Most recently, she managed to successfully balance family life with an active research and teaching career. "Kytai's story really stood out from the nominations, and the Materials Science Council were unanimous in their decision to award her," Suresh said. "Not only has she been a pioneer in the development of nanoparticles for controlled drug delivery and tissue engineering application but she achieved this having overcome substantial obstacles. We hope that this award will inspire other researchers who are facing challenges to see what can be achieved when working in and overcoming difficult circumstances." Nguyen was born in Saigon, South Vietnam and was 11 years old when the Vietnam War ended. Her father worked in the medical field alongside doctors from around the world, including the United States. When the Communist Party took control of South Vietnam after the war, the police routinely seized homes and property from those who had been wealthy or who had not supported North Vietnam during the war, then shipped them to the country's farm region or mountains to learn the value of labor. Nguyen's family chose to relocate to a farm, where Nguyen worked in the fields, often carrying buckets of harvested rice, sweet potatoes and vegetables, or water on a yoke over her shoulders. She attended high school and earned excellent grades, but was not accepted to a single university due to her family situation. In 1987, on her third attempt, Nguyen escaped Vietnam and made her way to Thailand and the Philippines before arriving in the United States in 1989, learning English along the way. She worked as a tutor, a research assistant and a dish washer in the cafeteria at the University of Minnesota while pursuing her bachelor's degree in chemical engineering. She earned her doctoral degree in chemical engineering from Rice University in 2000, just 13 years after leaving Vietnam. Nguyen also has battled cultural stereotypes. As an Asian woman, she was not expected to advance. Juggling family life and an active career in research has been difficult because of what is expected of her culturally. Nguyen has established herself as a leader in the field of nanomaterials, as well as a voice for minority students. funding as part of a consortium led by UT El Paso that hopes to expose underprivileged and minority undergraduate students to research early in their academic careers and increase their chances of continuing their education beyond a bachelor's degree. Nguyen's work is indicative of projects that expand health and the human condition as outlined in the Strategic Plan 2020: Bold Solutions | Global Impact. Nguyen joined UTA's Bioengineering Department in 2005 and was promoted to full professor in 2015. She is a Fellow of the American Heart Association and has authored or co-authored more the 60 highly cited publications. She has also mentored dozens of graduate and undergraduate students during her tenure at UTA. Read more about Nguyen's award at Elsevier Connect.